This is the '70's era Chestnut. 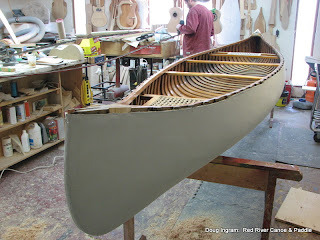 The filler has been curing for quite awhile now, and its hard enough to turn the canoe over to work on. The canvas is left untrimmed till this point so that the filler does not make a real mess on the wood. It now gets trimmed down to the planking level. 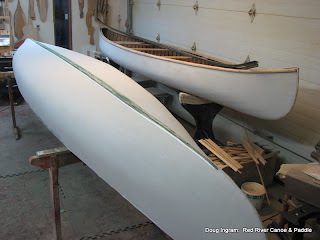 Then the gunnels are re-installed and sanded thoroughly. The keel gets put back on now, too. Here you can see both Chestnuts done. The 100 year old one is in the foreground, ready to receive the gunnels. 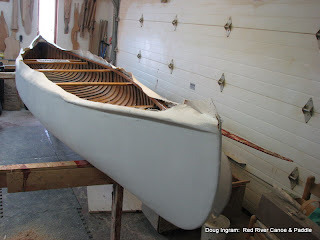 The gunnels are pre sanded along the bottom because there is no safe way to do this once they are installed. Posted by Doug Ingram at 9:53 a.m.